Getting Your Read On: Topaz Reign (Altered Stones, #2) by Teresa Richards + Giveaway! 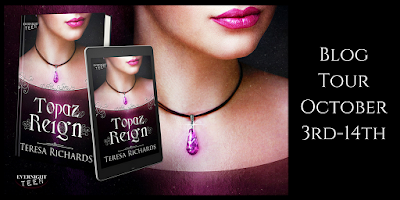 Topaz Reign (Altered Stones, #2) by Teresa Richards + Giveaway! One morning, Maggie wakes to find history turned on its head. Apparently, you can’t destroy a centuries-old curse without consequence. In order to prevent the changes in history from wiping out the present, Maggie resurrects her stalking gene and learns that fairy tales don’t stay dead for long. This is the second book in the Altered Stones series and I would highly recommend reading the first book before you attempt this one. I didn't have time to read the first book so the author was kind enough to send me a summary of the first book to read, which helped me out a lot but I could still tell I was missing out on things- most especially the connection with the characters. Things started out a bit slow for me. I think that may have been partially the problem of not reading the first book but it was a slow build in the beginning. About halfway through, momentum begins to build and I became more invested. I think by then I was also starting to get a handle on the characters and who they were. I thought the last part of the book was full of adventure and fun. 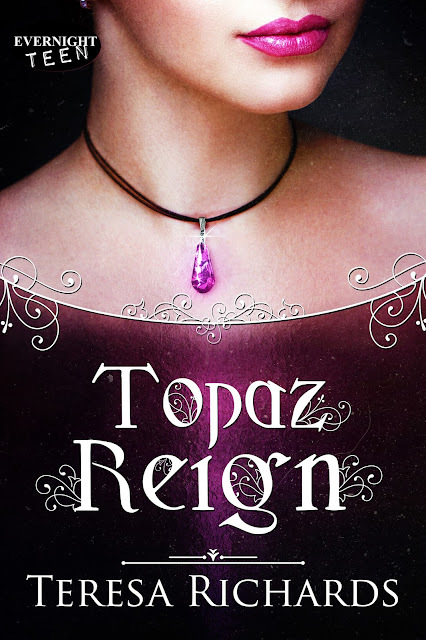 I enjoyed the fairy tale spin and I love the cover for this book! This book is geared toward the YA crowd and it definitely has the YA feel to it. It is a book I can happily pass off to my teenage daughter. - I received a copy of this book from the author as part of this blog tour. All opinions expressed are my own. Enter to win a paperback bundle of Emerald Bound and Topaz Reign, PLUS a bookmark signed by James Dashner, author of The Maze Runner! Monday, October 9--Why not? Because I said so!